Fourth of August is a very special day for all Kishoreda fans. It was on this day that Kishore Midas Kumar was born in 1929 to live a remarkable life and redefine Hindi cinema playback forever through his amazing artistry. He had a strong voice, a great ability to mold the same in numerous ways and a very deep sense of emotions, suras and ragas he sang, and this made him stand apart from the other greats of that era who made singing somewhat technical despite their ability to sway audiences. As a result, Kishoreda’s legacy continues to grow and charm the audiences of next generation as well. I keep my growing up nieces reminded of the cultural impact Kishoreda has caused over them. From titling movies from his songs to adopting his way of singing and making ads that sold items by playing his scores, the current Indian entertainment has plenty of Kishoreda imprints. I told my 16 year old niece of what impact MJ had caused over Hindi cinema, the day he passed away. It is not hidden that Hindi movies have plenty of imitation of MJ through their choreography. 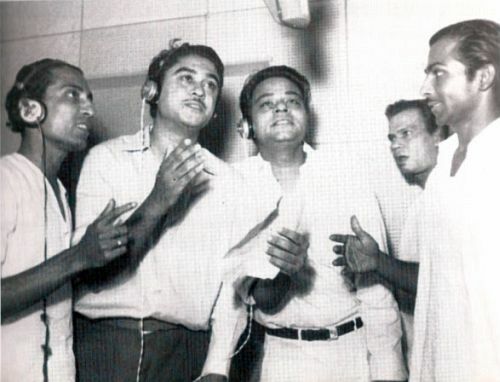 Kishoreda has given the current crop of listeners and performers the same legacy. I’d like to remember and thank Kishoreda on his 80th birth anniversary for the immense musical solace and fulfillment he has given us. Thank you kishoreda for bestowing my generation with an out of world experience through your unparalleled voice. Thank you Kishoreda for teaching us the ethics of good music and seeding the seeds of what I should call an ability to appreciate good talent irrespective of its class, creed or the cultural background it may belong to. Thank you Kishoreda for always making me believe I had something to appreciate in my own backyard, which could give the rest of the world a run for its own money. I never had any means to listen to western music, including that from the great names and banners such as Frank Sinatra, Elvis Presley, Beatles and Michael Jackson in the 70s and 80s, the times you swayed the Hindi music world. However, I never felt embarrassed or any reason to think I had missed anything essential, whenever faced with pro-Beatles, Elvis Presley or MJ listening and deck thumping audiences. Not to mention the savvy classical genre and its elite listeners…Kishoreda you could match them as well, in class, style and depth. Thank you Kishoreda for continuing to enthrall us through your golden era songs even today. May your glory shine forever, may you continue to live on in the minds and hearts of the Indian fans for a thousand more generations to come! I like to be a member of a renoun Fan Club of Kishore Kumar who really served for the memory Kishoreda. I am inhabitant of late Music Director S.D.Burman’s birthplace TRIPURA. I can imitate all the good song of Kishoreda. I Iike to devote Kishoreda with my song if I get a chance to perform. Please, supply me any source for this purpose.